I used to make lists, lists, and more lists. I still do, but not as many. All those lists started weighing me down and I started to feel like I was suffocating under them. So I stopped. But then I was forgetting things, and not being as productive, and kind of floating around lost. I didn't want to go back to the lists and endless lists though. Seriously. What to do. I needed something to give me a week "planner" at a time, but with my specific needs. I didn't want a real planner-too bulky yet not organized enough. I tried a 3 ring binder-yet again too bulky. Small notebooks? Not organized enough-too many pages to go through-where did I write that down? The things is I needed something portable-to take with me on the go-but also fast-my phone takes too much time (although if I weren't so visual it might be a good option). I also needed something with everything for at least a week on it. 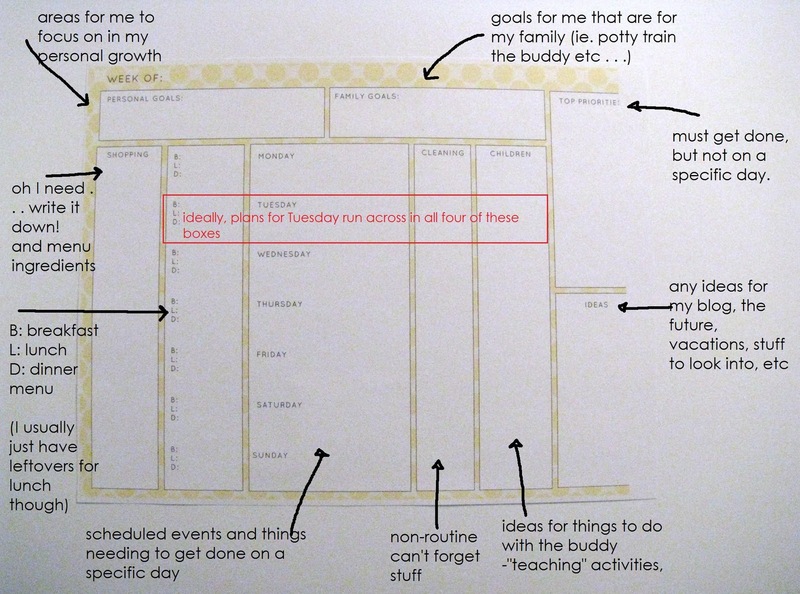 All the plans so I don't have random scraps of paper all over with blog posts lists and new recipe ideas. This was my solution: A one page weekly planner that I can fold up for on the go, but cram everything into and have an overview of the week plus my menu, shopping list, goals, and time with the buddy all lumped together. Kind of still lists, but not as hodge podged, and I don't write down "should do" things only "going to do" things. Two caviats to this though-I'm very visual and I'm kind of a fly by the seat of my pants sort of girl, so this is trying to give me a little order-most of you are probably way ahead of me on this one. The other is I like to write small-as in 1/8 inch small. So this works for me. I've made it into a two page format for those of you who don't like using a magnifying glass to decipher your "not" lists. Click here for the ONE page planner (my printer has a no-print margin on the bottom hence the run off on the right--still works for my needs though). You will not be able to read it unless the owner changes it to public on their "My Documents" page, or sends you a direct link. Donna! Yes, it should be fixed now! Thanks for asking. Any chance of this being published again? 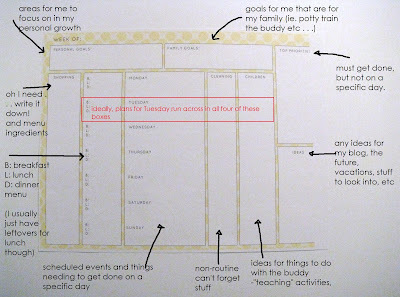 I've searched high and low for the perfect planning pages!